This picture was taken in March 2013 from the Hohonu Ridge tops east of Castle Hill. i.e. This photo is taken from the ridge immediately behind Mitchells at Lake Brunner and rather than looking NE out over Lake Brunner this view looks SE into the Hohonu Range. Of the three peaks pictured just the middle one is named. It is Taff Tor. 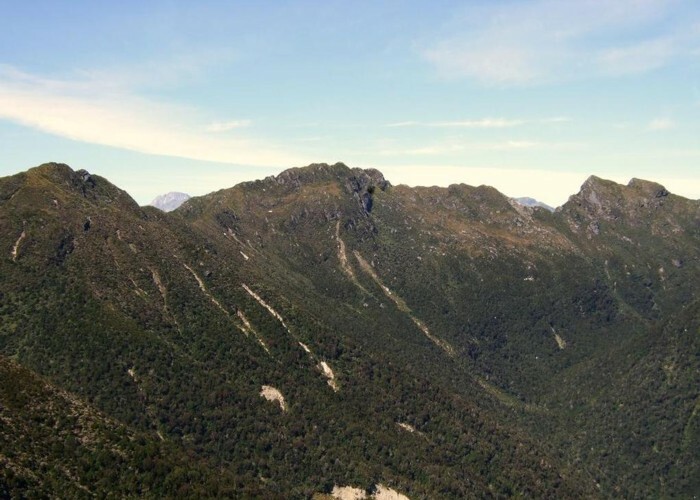 Much of the Hohonu Range is quite rugged and on a par with chunks of the Paparoa & Victoria Ranges. The location pointers shown are Castle Hill which is close to where the photo was taken from and Taff Tor the peak in the middle of the picture. glennj Got around to climbing Taff Tor in early Feb 2019 nearly six years after it captured my attention on the trip when I took this photo. Added 16 March 2013 by glennjglennj. 3 revisions, most recently 23 January 2019 by glennjglennj.